CANNIBALS! COKEHEADS! CROSS DRESSERS! CHEATS! Anyone who says there’s no such thing as bad publicity has clearly never been an NRL player caught drinking his own urine. They’ve never been a politician found in bed with a prostitute, or a media mogul caught up in a street fight. 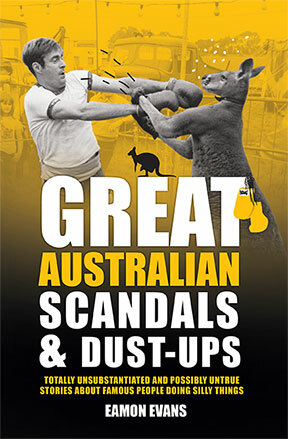 From turkey slaps and Twitter wars to less-than-subtle toilet trysts, Australia has given us some great scandals over the years, and a few good dust ups as well. Great Australian Scandals & Dust-Ups Brings together the best, boldest and bawdiest stories to ever hit the headlines. You’ll never look at fame the same way again.